James Boyer, a member of the Cavaliers, submitted this photo. This is a photo of me and a really close family friend, Matt Reynolds, who marched as a member of the Blue Devils. 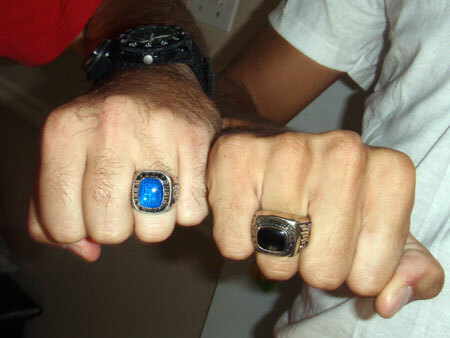 In the picture is his 1996 championship ring and my 2006 championship ring. We got together to watch some classic DCI performances before he headed out to California for flight training. Matt is the main reason that I got so into the drum corps activity. He let me borrow his 1992 World Championship video to watch the Blue Devils. I kept the tape running and ended up watching the Cavaliers show. From that moment I knew that I had to march as a member of the Cavaliers. I am currently living in Japan marching with the Aimachi Marching Band in Nagoya. I have marched with the Cavaliers since 2005, and I will "age out" in 2009. Matt marched with the Blue Devils in 1992, 1993 and 1996. We both play the baritone, and Matt's wife Sonja played mellophone for the Blue Knights in 1992.